For the Roger Waters album, see Amused to Death. 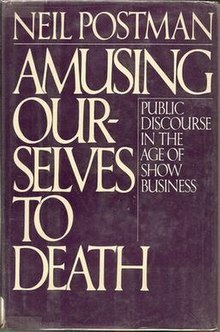 Amusing Ourselves to Death: Public Discourse in the Age of Show Business (1985) is a book by educator Neil Postman. The book's origins lay in a talk Postman gave to the Frankfurt Book Fair in 1984. He was participating in a panel on George Orwell's Nineteen Eighty-Four and the contemporary world. In the introduction to his book, Postman said that the contemporary world was better reflected by Aldous Huxley's Brave New World, whose public was oppressed by their addiction to amusement, than by Orwell's work, where they were oppressed by state control. It has been translated into eight languages and sold some 200,000 copies worldwide. In 2005, Postman's son Andrew reissued the book in a 20th anniversary edition. Postman distinguishes the Orwellian vision of the future, in which totalitarian governments seize individual rights, from that offered by Aldous Huxley in Brave New World, where people medicate themselves into bliss, thereby voluntarily sacrificing their rights. Drawing an analogy with the latter scenario, Postman sees television's entertainment value as a present-day "soma", the fictitious pleasure drug in Brave New World, by means of which the citizens' rights are exchanged for consumers' entertainment. The essential premise of the book, which Postman extends to the rest of his argument(s), is that "form excludes the content", that is, a particular medium can only sustain a particular level of ideas. Thus rational argument, integral to print typography, is militated against by the medium of television for this reason. Owing to this shortcoming, politics and religion are diluted, and "news of the day" becomes a packaged commodity. Television de-emphasises the quality of information in favour of satisfying the far-reaching needs of entertainment, by which information is encumbered and to which it is subordinate. Postman asserts the presentation of television news is a form of entertainment programming; arguing that the inclusion of theme music, the interruption of commercials, and "talking hairdos" bear witness that televised news cannot readily be taken seriously. Postman further examines the differences between written speech, which he argues reached its prime in the early to mid-nineteenth century, and the forms of televisual communication, which rely mostly on visual images to "sell" lifestyles. He argues that, owing to this change in public discourse, politics has ceased to be about a candidate's ideas and solutions, but whether he comes across favorably on television. Television, he notes, has introduced the phrase "now this", which implies a complete absence of connection between the separate topics the phrase ostensibly connects. Larry Gonick used this phrase to conclude his Cartoon Guide to (Non)Communication, instead of the traditional "the end". Postman refers to the inability to act upon much of the so-called information from televised sources as the information-action ratio. He contends that "television is altering the meaning of 'being informed' by creating a species of information that might properly be called disinformation—misplaced, irrelevant, fragmented or superficial information that creates the illusion of knowing something but which in fact leads one away from knowing". Drawing on the ideas of media scholar Marshall McLuhan – altering McLuhan's aphorism "the medium is the message" to "the medium is the metaphor" – he describes how oral, literate, and televisual cultures radically differ in the processing and prioritization of information; he argues that each medium is appropriate for a different kind of knowledge. The faculties requisite for rational inquiry are simply weakened by televised viewing. Accordingly, reading, a prime example cited by Postman, exacts intense intellectual involvement, at once interactive and dialectical; whereas television only requires passive involvement. Postman argues that commercial television has become derivative of advertising. Moreover, modern television commercials are not "a series of testable, logically ordered assertions" rationalizing consumer decisions, but "is a drama—a mythology, if you will—of handsome people" being driven to "near ecstasy by their good fortune" of possessing advertised goods or services. "The truth or falsity of an advertiser's claim is simply not an issue" because more often than not "no claims are made, except those the viewer projects onto or infers from the drama." Because commercial television is programmed according to ratings, its content is determined by commercial feasibility, not critical acumen. Television in its present state, he says, does not satisfy the conditions for honest intellectual involvement and rational argument. He repeatedly states that the eighteenth century, the "Age of Reason", was the pinnacle for rational argument. Only in the printed word, he states, could complicated truths be rationally conveyed. Postman gives a striking example: many of the first fifteen U.S. presidents could probably have walked down the street without being recognized by the average citizen, yet all these men would have been quickly known by their written words. However, the reverse is true today. The names of presidents or even famous preachers, lawyers, and scientists call up visual images, typically television images, but few, if any, of their words come to mind. The few that do almost exclusively consist of carefully chosen soundbites. Postman mentions Ronald Reagan, and comments upon Reagan's abilities as an entertainer. ...so elevated my prestige among undergraduates that I am hardly in a position to repudiate him or his kind of music. Nor do I have the inclination for any other reason. Nonetheless, the level of sensibility required to appreciate the music of Roger Waters is both different and lower than what is required to appreciate, let us say, a Chopin étude. ^ "Amusing Ourselves to Death: Public Discourse in the Age of Show Business". Library of Congress. Retrieved October 30, 2018. ^ Miles, Barry; Mabbett, Andy (1994). Pink Floyd - The Visual Documentary. London: Omnibus. ISBN 0-7119-4109-2. ^ Postman, Neil (1995). The End of Education: Redefining the Value of School. ^ "ATD - Neil Postman's Response". Retrieved 24 March 2019. Postman, Neil (1985). Amusing Ourselves to Death: Public Discourse in the Age of Show Business. USA: Penguin. ISBN 0-670-80454-1. Postman, Neil (1996). The End of Education: Redefining the Value of School. USA: Vintage Books. ISBN 0-679-75031-2.